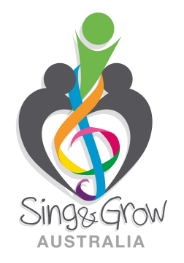 Welcome to Our Sing & Grow Website! We are so pleased to be able to offer our news and information in this more accessible way for families and professionals working with families with young children. We hope you like it! The start of 2013 has seen us active in communities nationally, with the Sing & Grow clinical team currently providing a total of 27 standard programs and 7 Community placements right around Australia. We continue to work collaboratively with a range of community partners in order to promote positive outcomes for young children and their families. Late last year we received news of the Federal Government’s additional funding to continue Sing & Grow programs in the East Devonport Community in collaboration with the East Devonport Child and Family Centre and to extend the range of services in the area into the Deloraine Community. We were delighted to receive this news as it means Alex Morse (Sing & Grow music therapist) can continue to use music as a fun and powerful tool to engage hard-to-reach families into the centre throughout 2013. Earlier this year we received the first results of our pilot study investigating the implementation of our community placement model. Preliminary data is showing significant pre-post outcomes in all measures of parent’s confidence in their parenting skills and use of music in the home environment. We look forward to sharing more detail of this study as it comes to hand. In the meantime, we will continue to develop our programs and services to achieve the best possible outcomes for participating families and communities and look forward to keeping you all abreast of the many exciting new initiatives in the ever growing world of Sing & Grow!